It’s no coincidence that some of the most beautiful women are the ones who care about what food they put into their bodies. I’ve even noticed this phenomenon with my own appearance, and maybe you have too. When I’m eating a well-balanced diet filled with fresh fruit and vegetables, my hair is shiny, my nails are strong, and my skin has a glow to it. And when I overindulge in greasy, fried or processed food, my complexion and tresses usually suffer. Purple cabbage. If you’re worried about wrinkles, eating lots of purple cabbage is the way to go. High cortisol levels in the body can cause crows feet and other wrinkles. Purple cabbage is both anti-inflammatory and rich in vitamins A, C, and E—which all help to lower cortisol levels. So next time you’re chopping up a salad, add some purple cabbage to your mixed greens. Edamame. Edamame and other non-processed soy foods are rich in isoflavones, which help to preserve skin-firming collagen. So, eat this sushi bar appetizer for youthful looking, wrinkle-free skin. Watercress. Ailments like uneven skin tone and hair loss are often signs of poor circulation. Rich in calcium, iron, and iodine, watercress helps to cleanse and oxygenate tissues for improved circulation and glowing skin. If you’re not a huge fan of the flavor, just add a little watercress to your green juice. Wild salmon. Wild salmon is full of healthy Omega-3 fatty acids, which keep your skin supple and your hair shiny. Salmon also contains selenium, a mineral that protects the skin from UV exposure. The vitamin D in salmon keeps bones and teeth healthy too. Whip up some of these yummy salmon tacos tonight. Beets. Beets naturally help to flush out the lymphatic system, which removes toxins from the body, and in turn brightens your eyes. Raw in a salad or roasted as a side, these are a delicious and nutritious beauty food. Cilantro. Cilantro has the ability to remove heavy metals that enlarge fat cells from your body. Enlarged fat cells increase the appearance of cellulite, making this common seasoning a great beauty food for your whole body. Walnuts. Along with keeping your scalp and hair healthy, the healthy fats in walnuts can make your skin more supple and resilient to issues like age spots and sagging skin. What a perfect midday snack! Yogurt. Since yogurt is higher in calcium than milk alone, it’s great for strengthening your nails, teeth, and even improving posture. I like to add a little low-fat or non-fat Greek yogurt to my morning smoothie for a calcium and protein boost. Water. Water may not be a food per se, but H2O is everything when it comes to beauty. When you’re body is dehydrated, every inch of your appearance suffers—from your skin to your hair to your nails to your eyes. If you have trouble sipping plain water all day, try these fruit-infused recipes. 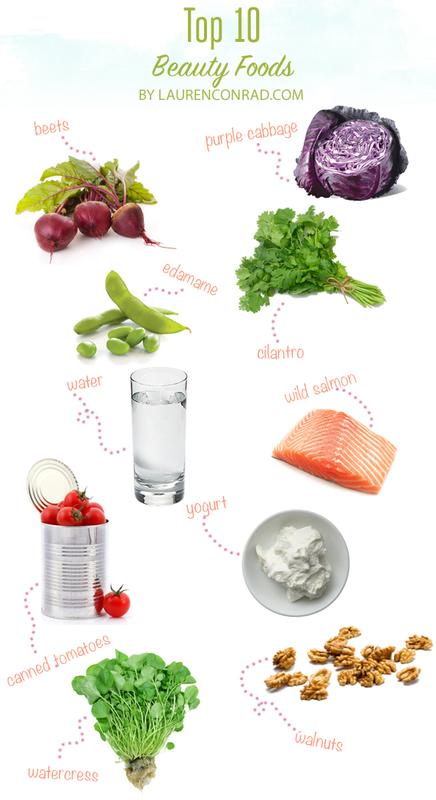 Which beauty food is your favorite? If you have any good recipes using these ingredients, please share a link in the comments below.